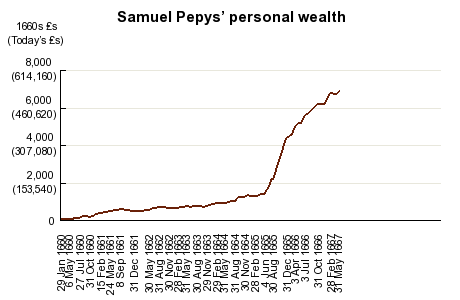 For a long time the Encyclopedia has contained a chart showing how Samuel Pepys’ wealth increased over time. It was a static image and wasn’t terribly attractive, so I’ve spruced it up and it’s now a little nicer. And here’s an image of the new one. That’s just an image, but on the Encyclopedia page you can hover your mouse over it (or tap on a phone/tablet) to see the exact value on different dates. I’ve also added a table listing all the monetary values, alongside two different measures of their equivalent values today. The final time Pepys mentioned his wealth was on 31 May 1667 when he had 6,900l. (“for which the Lord of Heaven be praised!”). Today that’s just over £1,000,000 in terms of what it would buy you. But the “prestige value”, comparing it to changes in per-capita GDP, is more like £23,000,000! A very nice upgrade, Phil: helpfully informative! What the diary also reveals is how Sam's spending increased too. Also, presumably not included in his accounts, were such goods as the silver plate* (mentioned in passing at the end of 1666), which would also have had a considerable monetary value if need be.